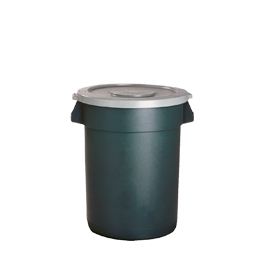 This plastic round receptacle has Reinforced Radial Ribs under Rim and Base to insure long-lasting stability. Handles are molded in for safe lifting and nesting. This can 22.5" x 19.5" Diameter is 100% Recyclable. Color: Gray. Cans availabe in 20 gallon 32 gallon, and 44 gallon as well as Snap-on Flat Lid Sizes to fit. Look at the universal Dollies on this website. They will fit all these cans as well as our competitors!